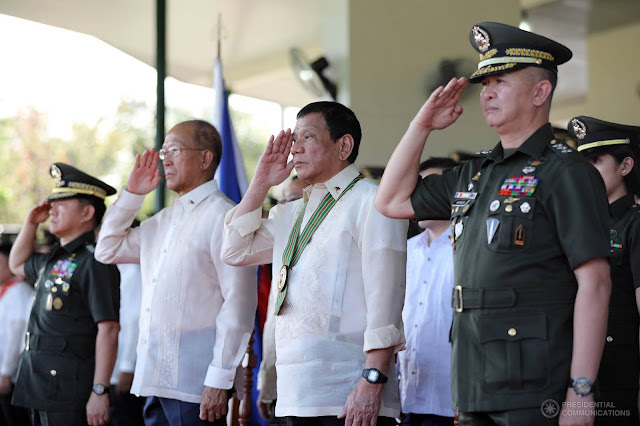 President Rodrigo Duterte reiterated his plan to revive the Reserve Officers Training Corps (ROTC), telling young athletes about the need for civilians to "sacrifice for the country" when needed. Speaking at the opening ceremonies of the 2017 Palarong Pambansa in Antique, Duterte warned that the alternative would be conscription, or compulsory military enlistment for all civilians. Saying the scrapping of the program in 2002 was "short-sighted," the President underscored the importance of ROTC, especially in light of recent terrorist threats and violence. "You have to go back to ROTC ... kasi 'yung mga ROTC [officers], 'yun 'yung may training. Reserve officers nga, eh. Because if there is really violence, anarchy, ang makakaalam niyan—ang marunong mag-handle ng M-16—'yung ROTC. 'Yun, sila ang mag-guide sa mga civilian na walang alam," he said. "Bakit mo tanggalin 'yung ROTC? Eh kung magkagulo tayo, ang ROTC ang magtuturo sa civilian paano maghawak ng baril, paano mag-load ng magazine, paano mag-repair, and how to fight. Or would you rather na I come up with a law that would conscript you? You know what is conscription? You are required by the government—gaya ng Israel, Hong Kong, Indonesia, Singapore, Malaysia—you are required to undergo military training. Compulsory," he added. "So make a choice: either you have ROTC training, so we can depend on you. Baka 'yang gulo na 'yan, mangyari matanda na kami. So you take care of the country ... So 'yun, sabi ko I'm here to announce it: I'm working on a law to restore the Reserve Officers' Training Corps," he went on. As he vouched for this move, Duterte underscored that Filipinos can only count on themselves in times of such violence. "Who else would defend you? You'll ask America for help? They will not die for you. Kayo ang magpakamatay sa bayan natin. That is a message from a father to the nation. Kayo ang magsakripisyo," he added. The President wants ROTC for in Grades 11 and 12, or senior high school, which he reportedly announced after a Cabinet meeting in February. Revival of the program will require an amendment to Republic Act No. 7077, or the "Citizen Armed Forces or Armed Forces of the Philippines Reservist Act."